USBThumb can be programmed with different firmware, including all Microchip samples from USB Framwework (use the ones for low pin count USB demo board). 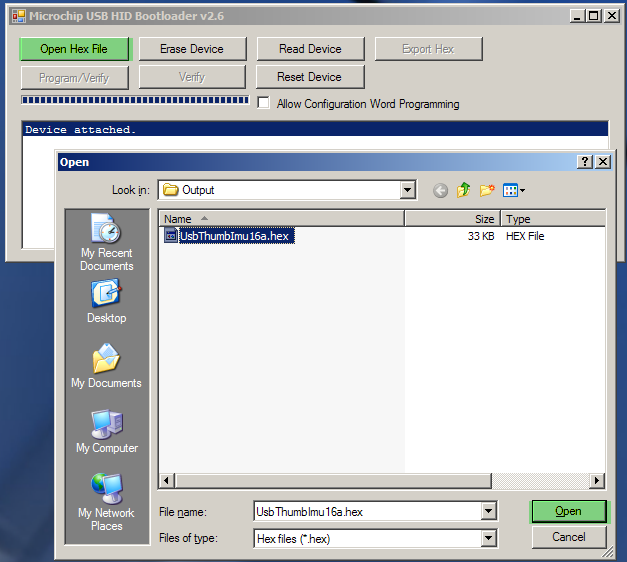 In order to upload a new firmware to USBThumb you need to enter the bootloader mode. This is done by connecting the VPP pin to ground during the time when device is plugged into the USB port. This can achieved by placing a jumper wire or a 1K resistor (recommended) between GND and VPP pin. GND pin is number 1, and VPP is number 5. Make sure you do not confuse VPP with the nearby VDD(pin number 4) or you will get a short !!! To be safe use a 1K or 10K resistor instead of the wire. Wire/resistor can be held by the spring action, it only needs to make contact during a split second while the device is plugged. If you plan on making frequent firmware updates , soldering a header is recommended. Next insert the USBThumb into the USB port (with the VPP and GND pins connected) , you should see a "Device attached." message in the USB HID Bootloader window. 3. Unplug the device from USB port. Remove the jumber wire/resistor between GND and VPP pin. 4. Plug the device back and verify the new firmware is working (it depends on firmware and what you expect it to do). I am using the USBThumb (with the pic18F14K50). I was able to load the Microchip Low Pin Count “USB Keyboard Demo”. Is there a schematic which shows how to wire up the parts, switches which correspond to the USB KeyBoard Demo firmware? Tony I think someone already replied to you on the Microchip forum the schematic for Low Pin Count board is here: http://ww1.microchip.com/downloads/en/DeviceDoc/41356B.pdf (Figure A.2). The schematic for USBThumb is here http://gadgetgangster.com/240 (See under Resources on the bottom of the page, direct link: http://gadgetgangster.com/scripts/displayasset.php?id=524 ). Sorry if it is beginner question. I have USBThumb + acc+ gyro. I could not find “USB Framwework”. In the future just google “microchip USB Framework”, it is now part of Applications Libraries, also they have an archive of older versions (I think I used 2.6 or so).